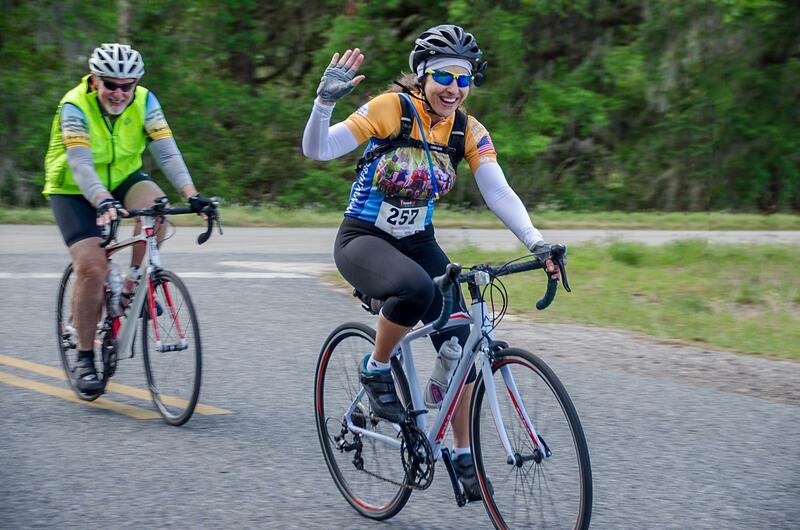 2019 PALATKA BICYCLE WEEKENDER ! This year we're proud to offer six wonderful routes spanning two days and designed to highlight the unique "Old Florida" cycling possibilities available in Putnam County. Over country lane and paved trail, through pine forest and potato field, from lazy river to sparkling lake, and passed mossy old barns and grand Victorian homes, we try to capture the beauty and spirit of our towns and countryside and stitch them together into a safe and scenic cycling experience. Every route will begin on the Historic North Side of Palatka, with some traveling over the St. Johns River and into the heart of Putnam County while others will venture through our city to destinations beyond. To help you stay on track we offer turn-by-turn cue sheets with maps, thoughtful and consistent signage, and GPX files for your GPS device. We've even made the routes available on Map My Ride if you'd like to zoom in and see them in greater detail. Every route includes at least one of our top-notch rest stops to keep you fueled and hydrated on your journey. Of course full SAG service is available and our volunteers will be monitoring the routes for the duration of the event should you need a hand. Buckman Lock Ride - 22.5 miles - Follow this popular, easy-paced route out to Buckman Lock for a rest stop and tour of the facility. Then return via a similar route to Palatka for your well-deserved lunch among friends on Downtown Palatka's beautiful Riverfront. Bike Florida "Share The Road" Metric Century - 63 miles - This 100km route heads south into the heart of Putnam County over slow country roads and rolling hills. Expect lake views, lightly trafficked back roads, pine forests, and loads of beautiful countryside. The route includes five rest stops - one nearly every ten miles - to fill your pockets with snacks and top up your water bottles along the way. Bike Florida "Share The Road" Century - 100 miles - Our signature ride is back and better than ever! You'll enjoy roller-coaster hills, slow country roads, forests, fields, and views of nearly every lake, river and creek in the southern half of our county! This lightly-trafficked route provides a unique glimpse into Old Florida guaranteed to refresh and delight those of you accustomed to riding in the city and along the busy beaches. Eight rest stops await you with cold drinks and snacks-a-plenty to keep you fueled and hydrated along the way. 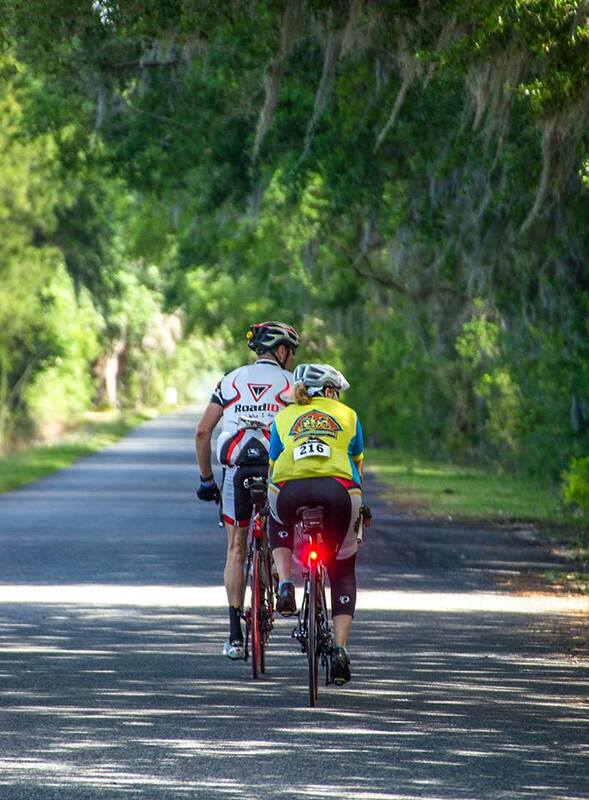 Don't forget to save a little bit of energy for the end as you'll have to climb the bridge back into Palatka! If the route does get the best of you we now offer a 3 mile "bail-out" leg from the 72 mile rest stop, and full SAG support if something goes wrong. Francis Ride - 19 miles - Our shortest Sunday route takes you past Mud & Pine Lakes to break at the Francis Sports Complex before returning to Palatka via country lanes and back roads. Half Metric - 31.1 miles - Our Half Metric heads out past Mud & Pine Lakes to Francis where we pick up the newly-paved section of the Palatka - Lake Butler Trail. You'll follow this scenic "new addition" to the trail head at Roberts Lane, then turn back and return through Francis and around Silver Lake to Palatka. Enjoy a fully stocked rest stop at the Robert's Lane turn-around to top your bottles and fill your pockets with yummy snacks. Metric Century - 60.1 miles - Like the half-metric our Metric Century heads to Francis where we pick up the newly-paved section of the Palatka - Lake Butler Trail. However this route follows the scenic trail past Roberts Lane, through Florahome and on to Twin Lakes Park. The route doubles back to Francis then proceeds around Silver Lake and back to Palatka. With a rest stop at the Twin Lakes turn-around and two passes by the Roberts Lane rest stop you'll have plenty of opportunities to fuel up and hydrate along the way. Every route ends at the River Center located across the street from the clocktower at the foot of the Memorial Bridge, just two blocks from event parking and the start of the ride across Reid Street. Lunch is included on both days with your registration. Additional lunches are available for unregistered guests for a small fee. While we expect some participants to return directly to their car, we do ask that you drop by the finish even if you don't plan to join us for lunch so that we'll know you completed your adventure successfully. As an added bonus early registration will include a limited run T-Shirt, the next in a series designed by local artist Addison Mitchell to commemorate the event. Be sure to register early, the cutoff for the T-shirt order is March 31 and they will not be included with late registration! Looking for something to keep busy Saturday evening? We'll also offer a Sunset Cruise Saturday evening on the Pride Of Palatka Riverboat. This cruise will showcase the natural beauty of the St. Johns River and will include beer, wine and hors d'oeuvres, all for just $40. Please register early as seating is limited and we sold out quickly last year. Finally, a portion of the proceeds will be used to support Bike Florida's "Share The Road" program, with the remainder to further Putnam Blueway's & Trails initiative to enhance our way-finding tools with new signs, maps, a website and more, all intended to facilitate the use of our developing multi-use trail system. The 2019 Palatka Bicycle Weekender will be held rain or shine and all purchases are final and non-refundable. However tickets are transferable so if something comes up last minute just let us know who you've invited and we'll swap them in for you. T-shirt sizes cannot be exchanged, and shirts will be made available for pickup following the event if you are unable to attend. Tickets for the cruise only will be refunded in the event of cancellation. Choose this option to ride the Buckman Lock Tour, the Share The Road Metric or the Share The Road Century on Saturday. Early Registration, includes T-Shirt designed by Local Artist! Price DOES NOT include T-Shirt ! Choose this option to ride the Francis 19, the Sunday Half Metric or the Sunday Metric Century. Choose this option if you'd like to join us for the whole weekend!